Ryukyu Shimpo – Okinawa, Japanese newspaper, local news » Dazzling Ryukyu Beauty on Display at Okinawan Bingata Exhibit in Washington D.C. 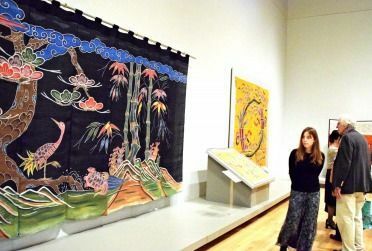 Dazzling Ryukyu Beauty on Display at Okinawan Bingata Exhibit in Washington D.C. The first ever overseas bingata exhibit titled, “Bingata! Only in Okinawa,” was unveiled at the George Washington University Museum’s Textile Museum in Washington D.C. on November 5. Starting with bingata kimonos from the noble Sho and Fukuchi families, the collection comprises around 100 Japanese national treasures. Included in the collection, which is on display until January 20, 2017 are works by Yuko Tamanaha and bingata-style dresses designed by Kanna Yamauchi.